Anastasios Bakasetas is a footballer currently playing for AEK and for the National Team. Bakasetas signed his first professional contract in 2009 after coming through the youth system at Asteras Tripolis. 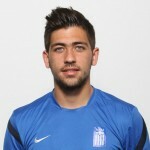 After spending the first eighteen months with his club, he join Thrasyvoulos on loan for the remaining six months of the 2010-11 season before returning to Asteras. Bakasetas played with Asteras until he joined Aris on loan in January of 2014 for the remainder of the season. In January 2015 he transferred to Panionios. On June 2016, he signed a three-years contract with AEK. He was selected in the Greece U-19 squad for the 2011 UEFA European U-19 Championship and made his debut against the Republic of Ireland on July 2011. He made his debut with National U-21 in UEFA Euro qualifying against Cyprus in September 2012. On 19 May 2016, was called up for the friendly matches against Australia.